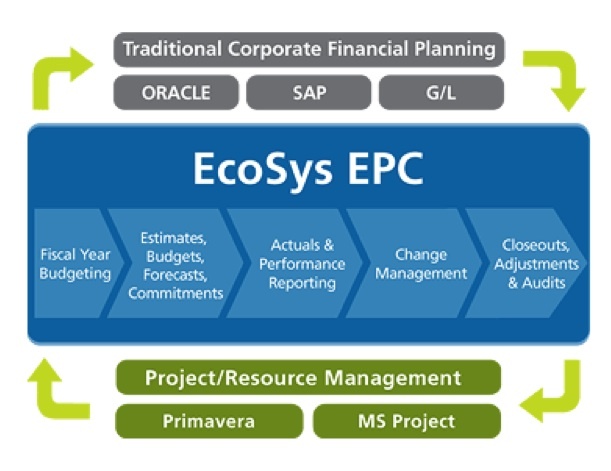 EcoSys EPC™ (Enterprise Planning & Controls) is the global standard for project controls software. The easy-to-use web-based platform helps EPCs and owner operators worldwide plan and optimize project portfolios, control project costs, and improve project performance. Built-in, full life cycle best practices – including budgeting, forecasting, and change management through performance measurement and strategic functions like capital planning and project portfolio management – drive improved project performance. EcoSys EPC is a hub for data integration, delivering greater efficiency and accuracy and feeding the built-in business intelligence engine. Identify potential cost and schedule issues before they spiral out of control and get projects back on track. Real-time visibility into project metrics serves as an early warning system, allowing project teams to proactively root out sources of cost and schedule overrurns before it’s too late. With data integration and automated reporting, improve efficiency and spend less time consolidating data, manually creating Excel reports, or troubleshooting errors. Built-in solutions combined with configurable workflows ensure that your carefully developed processes for project success are being used across the entire organization. WHEN WE SURVEYED THE MARKET, IT QUICKLY BECAME OBVIOUS THAT ECOSYS EPC WAS THE ONLY PRODUCT CAPABLE OF MEETING OUR NEEDS. EPC WILL FREE UP OUR PROJECT MANAGERS’ TIME TO FOCUS ON MANAGING PROJECTS RATHER THAN CRUNCHING NUMBERS. Industry-leading technology creates a definitive source of project data including schedules, costs, commitments, timesheets, and more. End users create tabular reports and graphical dashboards out of real-time data from virtually any data dimension. The flexible, familiar interface aids user adoption, while eliminating the challenges and errors of desktop spreadsheets. Be running in just weeks with out-of-the-box best practices or tailor the system to your organization’s own processes. EcoSys EPC’s web technology delivers low total cost of ownership with options for On-premise, Hosted, or SaaS licensing.